Below is the Buffalo News Story about crime and other issues in University Heights. I think it is a well balanced article accurately describing the current atmosphere and concerns in the heights. 1: I think bike patrols and a larger presence in the Heights by the University police is a great idea and long over due. 2: What Canisius College has done in their neighborhood is sort of a model for what UB could be doing. Yes I know there are far more students at UB, but the presence in the community and the way Canisius has bought up property and become part of the community fabric is a great thing, UB does not need to reinvent the wheel here. John Proudman didn’t relish the job. His moving company had been hired to pack up Javon R. Jackson’s belongings following the murder of the University at Buffalo graduate three days earlier. Out of nowhere, it seemed, came a series of gunshots shattering the late morning stillness on Lisbon Avenue. The fact that someone would use a gun in broad daylight, in the middle of what seemed to be a peaceful neighborhood, struck Proudman and his coworker as bizarre. Unfortunately, crime is part of life for residents of University Heights, the neighborhood that surrounds one of Buffalo’s enduring economic engines, UB’s South Campus, and where off-campus students and city residents mix. Like it or not, muggings, assaults, burglaries and homicides are part of life in a neighborhood many consider crucial to Buffalo’s renaissance. In the past three years, three homicides — including last Sunday’s shooting death of the 23-year-old Bronx man the day after his graduation — plus one beating so severe that a UB student was left paralyzed have occurred in the neighborhood. No one is suggesting the Heights ranks among Buffalo’s most dangerous neighborhoods, but there is a feeling, even among longtime residents, that crime is on the rise. “My father called after he heard about the death and told me to start applying to other colleges,” said Scibilia, a Rochester native. Few people are as familiar with University Heights and what ails it as neighborhood activist David J. Ellerbrock. For Ellerbrock, president of the University Heights Collaborative, the rejuvenation of his community hinges on improved public safety. And that, he says, depends on its stakeholders — residents, students, business owners and UB employees — becoming better acquainted with each other. 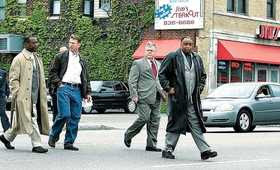 He singled out UB, the neighborhood’s largest institution, as a player that needs to get more involved in the Heights. “What we haven’t seen is a push on behalf of UB decision-makers to encourage UB employees who live in the neighborhood to become engaged in neighborhood revitalization,” Ellerbrock said. He praised UB President John B. Simpson for his UB 2020 initiative, which aims to increase the student population by 10,000 and increase faculty and staff by 2,500. Jackson’s death, he added, will provide a further test “of UB’s leadership in this community.” Ellerbrock thinks a good first step would be the addition of more police patrols by either the city or the university in the neighborhood around UB. City police say they had increased patrols prior to Jackson’s killing. But residents and students say an even greater effort is needed and point to UB for help. UB’s 61-member police force does patrol the campus and the streets on its perimeter, but it does not go into the neighborhoods around the campus. “It’s a possibility, and we’re considering all options,” said UB Police Chief Gerald W. Schoenle Jr.
At a meeting held last week, city and university officials discussed expanding UB’s presence on Main Street and adding more surveillance cameras to the area. The meeting was held at the direction of Simpson and Mayor Byron W. Brown. One improvement might be UB police officers on foot and bicycle patrols along Main. “We’re talking about getting out of the cars,” Black said. The university also might expand its use of surveillance cameras. UB has three cameras operating now, including one that may have provided police information about the Jackson shooting. Black also noted that the first officer on the scene at last Sunday’s shooting was a UB police officer. At Canisius College, farther south on Main Street, 25 public safety officers routinely patrol the streets surrounding the college where students live in off-campus housing. Unlike UB’s South Campus, with its close proximity to nightspots on Main Street — which sometimes fuel alcohol-related crimes — Canisius does not have a nearby nightlife district. But, to be sure, Canisius students are not immune to neighborhood crimes. Schoenle thinks it’s unfair to compare Canisius with its approximately 3,400 students to UB, the biggest school in the State University of New York system, with 28,000 students. The possibility that UB and Buffalo police might jointly patrol Main Street is the kind of police initiative that Michael K. Clarke, a neighborhood development expert, thinks is needed in the Heights. “Greater collaboration between various police agencies is essential to give people the feeling of safety they need to invest and live in the neighborhood,” said Clarke, executive director of the Local Initiatives Support Corp. in Buffalo. Clarke is quick to note that crime is not the only challenge chewing away at the Heights’ foundation. “You have undergraduates moving away from the neighborhood, living in university apartments on or near the North Campus in Amherst, and the lowering of income and economic potential over the years,” said Clarke. Yet, he sees at least one important bright spot: Heights residents want to preserve their neighborhood. He pointed to members of the Collaborative, St. Joseph University Catholic Church, Gloria J. Parks Community Center and the local business community on Main Street. “They understand that the perception of the neighborhood is [that it is] unsafe and undermines their efforts,” he said. No one has to tell John Proudman about perceptions. The three gun shots he heard in broad daylight last week are proof enough for him.